Each course will dig deep into current community issues and be taught by professionals who are currently leading projects throughout Los Angeles. This fall you can explore best practices in Professional Development Skills & Issues in Community Development with Lucia Torres, who has been doing on the ground work with community for over 15 years. 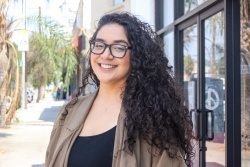 Lucia Torres was born and raised in the San Fernando Valley where she began her community organizing and advocacy when she was a student at Pacoima Jr. High School. She received her B.A in Chicano/a Studies from UCLA and went on to receive her Masters in Public Administration from CSUN. She has over 15 years of professional experience in community building and Non-Profit sector, working in the communities of Sylmar, Pacoima, Boyle Heights and South Central. Lucia has a strong value for innovation, creativity and efficiency. Throughout her career, she has developed youth-based programs and built both social justice and professional development curriculums. Lucia also has a background in event management and communications; she has used these skills to support emerging non-profits with creating communications, marketing and development strategies that have increased impact and reach. She is currently a Program and Communications Manager at CDTech, where she is managing curriculum and communications development while supporting emerging leaders through the Public Allies, Los Angeles program. The Professional Development Skills & Issues in Community Development (CP 11) will meet every Tuesday from 6:00 PM – 9:10 PM beginning August 27th through December 16th. The course will provide students with an understanding of personal & professional development strategies, writing & communications skills and industry insights for networking and collaboration.